Two Japanese women are feeding voracious silk worms. Just look at how huge the basket is that the woman is pulling leaves from. After silkworm eggs were hatched in an incubator, the young worms were moved to a feeding room like the one in this image. At first they were fed mulberry leaves that had been made into an ash. Later they were fed on chopped leaves, and eventually full-sized leaves, as seen here. Feeding was extremely hard work as for thirty days the worms had to be fed the exact right quantity of food six times a day. For the women—as it was women who did the feeding—it was like having rooms full of babies. The thirty day feeding period was interrupted by four periods of “sleeping” or min. The min lasted for two days, while the feeding periods, called rei, lasted between three to six days. Roughly on the thirtieth day after emerging from the egg, the worms began spinning their cocoons. Signs of silk culture began to appear in shrubberies of mulberry trees, and white and sulphur yellow cocoons were lying in the sun along the road in flat trays. Numbers of women sat in the fronts of the houses weaving cotton cloth fifteen inches wide, and cotton yarn, mostly imported from England, was being dyed in all the villages—the dye used being a native indigo, the Polygonum tinctorium. Old women were spinning, and young and old usually pursued their avocations with wise-looking babies tucked into the backs of their dresses, and peering cunningly over their shoulders. Although Bird’s description makes it all look very idyllic and romantic, the silk industry was a very important export business that helped launch Japan on its road to industrialization. As Japan had closed itself off from the outside world for hundreds of years, Japanese businessmen had a hard time finding markets where they could compete after the country opened its borders in the mid-19th century. One industry that succeeded was silk. This was partly due to plain luck. Just as Japan entered the silk market, the European silk industry had collapsed due to an epidemic of several silkworm diseases resulting in higher prices for silk. Additionally, the Suez Canal opened in 1869 (Meiji 2), dramatically lowering transportation costs from Japan to Europe. 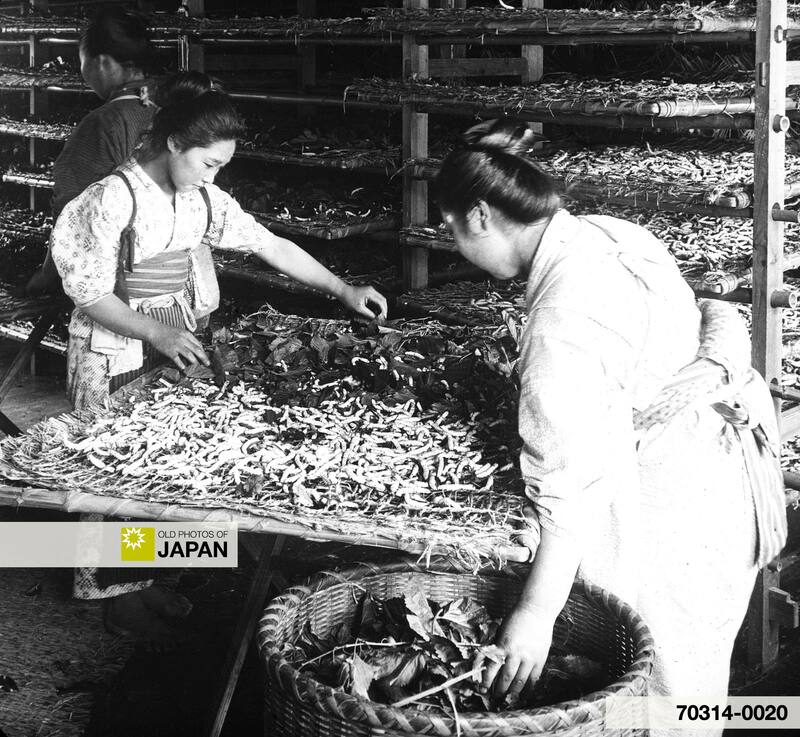 The profits that the Japanese were able to make as a result of these developments, fueled tremendous growth. Raw silk as well as cotton yarn and fabrics, were for a long time Japan’s main source of foreign exchange. 1 Bird, Isabella L. (1911). Unbeaten Tracks in Japan: An account of travels in the interior including visits to the aborigines of Yezo and the shrine of Nikko. John Murray: 25. 2 Watkins, Thayer; San José State University Department of Economics, Meiji Restoration/Revolution. Retrieved on 2009-05-08. 3 Some brief information about the working conditions of women in the Japanese silk industry can be found in Working Women of Japan, by Sidney L. Gulick (1915), pp 32-35. You can also licence this image online: 70314-0020 @ MeijiShowa.com. I’d like to request permission to use this photo in an 6-month exhibition this summer: 70314-0020. Will you let me know the fee?